The Cranford Mitts is one of our most popular patterns and has been donated to the p/hop project by Jane Lithgow. We hope you enjoy knitting this pattern and don’t forget to give it a p/hop rating! To see what others have made from this pattern, please visit the Cranford Mitts pattern page on Ravelry. Cranford Mitts in the news. Exciting news, our Cranford Mittens pattern gets a well deserved mention on BBC Radio 4’s Today programme! We are having another Cranford Mitt-a-long in September 2011. Please join in the fun. Details are in our Ravelry group. Feel free to use the banners below on your blog. Project badges for your Ravelry project pages. Click on them for a larger image, then save to your computer or use Ravelry’s photo slurping feature on the project photo page. 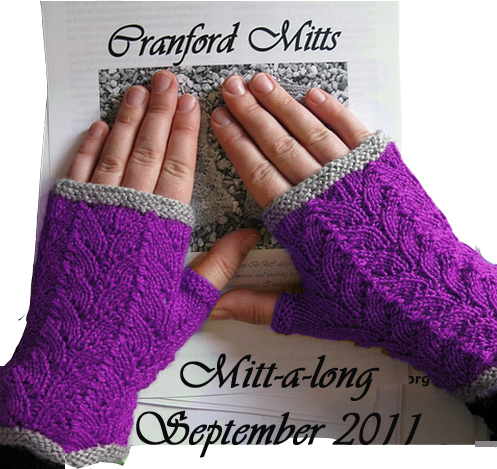 We had a great Cranford Mitt-a-long in November and December 2010 with over 50 pairs of Cranford Mitts being made. Though the official knit-a-long has finished the thread is still going in Ravelry so please feel free to join in. Join in the Cranford-Mitt-a-long in the p/hop Ravelry group, November 2010.